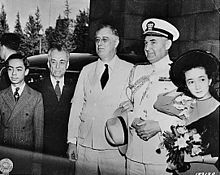 The Commonwealth government continued its existence as a government-in-exile in the United States during the Japanese Occupation and later as the Third Republic. In effect, there existed two Philippine governments during the Japanese occupation. The Commonwealth of the Philippines (Spanish: Commonwealth de Filipinas; Tagalog: Komonwelt ng Pilipinas) was the administrative body that governed the Philippines from 1935 to 1946, aside from a period of exile in the Second World War from 1942 to 1945 when Japan occupied the country. It replaced the Insular Government, a United States territorial government, and was established by the Tydings–McDuffie Act. The Commonwealth was designed as a transitional administration in preparation for the country's full achievement of independence. During its more than a decade of existence, the Commonwealth had a strong executive and a Supreme Court. Its legislature, dominated by the Nacionalista Party, was at first unicameral, but later bicameral. In 1937, the government selected Tagalog – the language of Manila and its surrounding provinces – as the basis of the national language, although it would be many years before its usage became general. Women's suffrage was adopted and the economy recovered to its pre-Depression level before the Japanese occupation in 1942. This led to the creation and passing of a new bill known as Tydings–McDuffie Act,[b] or Philippine Independence Act, which allowed the establishment of the Commonwealth of the Philippines with a ten-year period of peaceful transition to full independence – the date of which was to be on the 4th July following the tenth anniversary of the establishment of the Commonwealth. The new government embarked on ambitious nation-building policies in preparation for economic and political independence. These included national defense (such as the National Defense Act of 1935, which organized a conscription for service in the country), greater control over the economy, the perfection of democratic institutions, reforms in education, improvement of transport, the promotion of local capital, industrialization, and the colonization of Mindanao. Japan launched a surprise attack on the Philippines on December 8, 1941. The Commonwealth government drafted the Philippine Army into the U.S. Army Forces Far East, which would resist Japanese occupation. Manila was declared an open city to prevent its destruction, and it was occupied by the Japanese on January 2, 1942. Meanwhile, battles against the Japanese continued on the Bataan Peninsula, Corregidor, and Leyte until the final surrender of United States-Philippine forces in May 1942. Quezon and Osmeña were escorted by troops from Manila to Corregidor, and later left for Australia prior to going to the U.S., where they set up a government in exile, based at the Shoreham Hotel, in Washington, D.C. This government participated in the Pacific War Council as well as the Declaration by United Nations. Quezon became ill with tuberculosis and died from it, with Osmeña succeeding him as president. The main general headquarters of the Philippine Commonwealth Army (PCA), located on the military station in Ermita, Manila, was closed down on December 24, 1941. Upon arrival of the Japanese Imperial forces which occupied Manila on January 2, 1942, the defunct PCA main headquarters in the capital city was occupied as the Japanese assumed control. Subsequent to commencement of the Japanese occupation, from January 3, 1942 to June 30, 1946, during and after the Second World War, the general headquarters and military camps and bases of the PCA military stations in the main provinces of the Philippine Archipelago from Luzon, Visayas and Mindanao were openly under control of the PCA service and began local military conflicts and to engage operations against the Japanese Occupation in this country. Meanwhile, the Japanese military organized a new government in the Philippines known as the Second Philippine Republic, headed by president José P. Laurel. This pro-Japanese government became very unpopular. Resistance to the Japanese occupation continued in the Philippines. This included the Hukbalahap ("People's Army Against the Japanese"), which consisted of 30,000 armed men and controlled much of Central Luzon. Remnants of the Philippine Army also successfully fought the Japanese through guerrilla warfare, eventually liberating all but 12 of the 48 provinces. 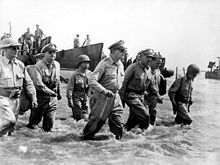 General Douglas MacArthur's army landed on Leyte on October 20, 1944, and were welcomed as liberators, as were the Philippine Commonwealth troops who arrived in other amphibious landings. The Philippine Constabulary was placed on active service with the Philippine Commonwealth Army and re-established on October 28, 1944 to June 30, 1946 during the Allied liberation to Post-World War II era. Fighting continued in remote corners of the Philippines until Japan's surrender in August 1945, which was signed on September 2 in Tokyo Bay. Estimates of Filipino war dead reached one million, and Manila was extensively damaged when Japanese marines refused to vacate the city when ordered to do so by the Japanese High Command. The Commonwealth had two official languages; Spanish, and English. Due to the diverse number of Philippine languages, a program for the "development and adoption of a common national language based on the existing native dialects" was drafted in the 1935 Constitution. The Commonwealth created the Surián ng Wikang Pambansà (National Language Institute), which was initially composed of President Quezon and six other members from various ethnic groups. A deliberation was held and Tagalog, due to its extensive literary tradition, was selected as the basis for the "national language" to be called "Pilipino". In 1940, the Commonwealth authorized the creation of a dictionary and grammar book for the language. In that same year, Commonwealth Act 570 was passed, allowing Filipino to become an official language upon independence. The Commonwealth had its own constitution, which remained effective until 1973, and was self-governing although foreign policy and military affairs would be under the responsibility of the United States, and Laws passed by the legislature affecting immigration, foreign trade, and the currency system had to be approved by the United States president. 2 End of Commonwealth government, independent Republic inaugurated. In 1935 Quezon won the Philippines' first national presidential election under the banner of the Nacionalista Party. He obtained nearly 68% of the vote against his two main rivals, Emilio Aguinaldo and Bishop Gregorio Aglipay. Quezon was inaugurated in November 1935. He is recognized as the second President of the Philippines. When Manuel L. Quezon was inaugurated President of the Philippines in 1935, he became the first Filipino to head a government of the Philippines since Emilio Aguinaldo and the Malolos Republic in 1898. However, in January 2008, Congressman Rodolfo Valencia of Oriental Mindoro filed a bill seeking instead to declare General Miguel Malvar as the second Philippine President, who took control over all Filipino forces after American soldiers captured President Emilio Aguinaldo in Palanan, Isabela on 23 March 1901. Quezon suffered from tuberculosis and spent his last years in a 'cure cottage' in Saranac Lake, NY, where he died on August 1, 1944. He was initially buried in Arlington National Cemetery. His body was later carried by the USS Princeton and re-interred in Manila at the Manila North Cemetery before being moved to Quezon City within the monument at the Quezon Memorial Circle. Roxas served as the President of the Commonwealth of the Philippines in a brief period, from his subsequent election on May 28, 1946 to July 4, 1946, the scheduled date of the proclamation of Philippine Independence. Roxas prepared the groundwork for the advent of a free and independent Philippines, assisted by the Congress (reorganized May 25, 1946), with Senator José Avelino as the Senate President and Congressman Eugenio Pérez as the House of Representatives Speaker. On June 3, 1946, Roxas appeared for the first time before the joint session of the Congress to deliver his first state of the nation address. Among other things, he told the members of the Congress the grave problems and difficulties the Philippines were set to face and reported on his special trip to the U.S. — the approval for independence. On June 21, he reappeared in another joint session of the Congress and urged the acceptance of two important laws passed by the U.S. Congress on April 30, 1946 regarding the Philippine lands. They are the Philippine Rehabilitation Act and the Philippine Trade Act. Both recommendations were accepted by the Congress. ^ a b "Constitutional Law". Philconsa Yearbook. Philippine Constitution Association. 1965. Retrieved September 26, 2014. "Balangkas at Layunin ng Pamahalaang Komonwelt". Bureau of Elementary Education. Department of Education. 2010. Archived from the original on August 16, 2016. Retrieved September 26, 2014. ^ a b c Mair, Christian (2003). The politics of English as a world language: new horizons in postcolonial cultural studies. NL: Rodopi. pp. 479–82. ISBN 978-90-420-0876-2. Retrieved February 17, 2011. 497 pp. Roger M. Thompson (January 1, 2003). Filipino English and Taglish: Language Switching from Multiple Perspectives. John Benjamins Publishing. pp. 27–29. ISBN 90-272-4891-5. Christian Mair (January 1, 2003). The Politics of English as a World Language: New Horizons in Postcolonial Cultural Studies. Rodopi. p. 480. ISBN 90-420-0876-8. Antonio L. Rappa; Lionel Wee Hock An (February 23, 2006). Language Policy and Modernity in Southeast Asia: Malaysia, the Philippines, Singapore, and Thailand. Springer Science & Business Media. p. 68. ISBN 978-1-4020-4510-3. ^ a b c Timeline 1930–1939, PH: St. Scholastica's College . ^ Roosevelt, Franklin D (November 14, 1935), "Proclamation 2148 on the Establishment of the Commonwealth of the Philippines", The American Presidency Project, the Commonwealth Road, consecrated on October 23, 1937, Santa Barbara: University of California, This Proclamation shall be effective upon its promulgation at Manila, Philippine Islands, on November 15, 1935, by the Secretary of War of the United States of America, who is hereby designated as my representative for that purpose. ^ Castro, Christi-Anne, Associate Professor University of Michigan (April 7, 2011). Musical Renderings of the Philippine Nation. U.S.: Oxford University Press. p. 204. ISBN 978-0-19-974640-8. Retrieved July 3, 2013. ^ "The Philippine Commonwealth", The New York Times, November 16, 1935, retrieved October 1, 2009 . ^ Philippine Autonomy Act (Jones Law), The corpus juris, archived from the original on February 26, 2009 . ^ a b c d e f "Philippines, The period of U.S. influence" (online ed.). Encyclopædia Britannica. Retrieved February 10, 2007. ^ "Hare-Hawes-Cutting-Act" (online ed.). Encyclopædia Britannica. Retrieved February 10, 2007. ^ "Tydings-McDuffie Act". Encyclopædia Britannica Online. Retrieved February 10, 2007. ^ "Text of the Tydings-McDuffie Act". The ChanRobles Group. Retrieved February 10, 2007. ^ Constitution of the Commonwealth of the Philippines, The corpus juris, 1935, archived from the original on May 22, 2009 . ^ a b "Philippine History". DLSU-Manila. Archived from the original on August 22, 2006. Retrieved February 11, 2007. ^ "Balitang Beterano: Facts about Philippine Independence". Philippine Headline News Online. February 2004. Retrieved February 11, 2007. ^ "Philippine history American Colony and Philippine Commonwealth (1901–1941)". Windows on Asia. MSU. Archived from the original on October 10, 2007. Retrieved February 11, 2007. ^ a b "American Colony and Philippine Commonwealth (1901–1941)". Filipinas Heritage Library. Archived from the original on January 29, 2007. Retrieved February 12, 2007. ^ "Statistical Abstract of the United States" (PDF). census.gov. United States Department of Commerce. 1941. Retrieved September 8, 2014. ^ Bailey, Rayne (2009). Immigration and Migration. Infobase Publishing. p. 107. ISBN 9781438109015. Retrieved September 8, 2014. ^ Thompson, Roger M. (2003). Filipino English and Taglish: Language Switching from Multiple Perspectives. John Benjamins Publishing. p. 27. ISBN 9789027248916. Retrieved September 7, 2014. ^ Thompson, Roger M. (2003). Filipino English and Taglish: Language Switching from Multiple Perspectives. John Benjamins Publishing. p. 61. ISBN 9789027248916. Retrieved September 7, 2014. ^ "Constitutions of the Philippines". The ChanRobles Group. Retrieved February 10, 2007. ^ "The Yamashita Standard". PBS. Retrieved February 12, 2007. ^ a b c d "A History of Plebiscites in the Philippines". Arab News. Retrieved February 12, 2007. ^ INQUIRER.net. "Did you know: 1st national elections in PH held on Sept. 16, 1935". newsinfo.inquirer.net. Retrieved March 27, 2019. ^ "Inaugural Address of President Manuel L. Quezon, November 15, 1935 | GOVPH". Official Gazette of the Republic of the Philippines. Retrieved March 27, 2019. ^ "Manuel L. Quezon | Presidential Museum and Library". Retrieved March 27, 2019. ^ Villegas, Bernardo (September 18, 2015). "My Lolo Miguel, the hero". Manila Bulletin. Retrieved March 27, 2019. ^ III, Manuel L. Quezon. "OPINION: The vice-presidency: a briefer". ABS-CBN News. Retrieved March 27, 2019. ^ "MLQ's colorful language". Manila Bulletin News. Retrieved March 27, 2019. ^ Katz, Deborah. "Manuel L. Quezon, President Of The Philippines, Rescuer Of Jews". Retrieved March 27, 2019. ^ Tan, Michael L. "Quezon and TB". opinion.inquirer.net. Retrieved March 27, 2019. ^ Baron, Scott (January 14, 2019). Valor of Many Stripes: Remarkable Americans in World War II. McFarland. ISBN 9781476674414. ^ "Museo ni Manuel Quezon". National Historical Commission of the Philippines. Retrieved March 27, 2019. ^ a b "Sergio Osmeña | president of Philippines". Encyclopedia Britannica. Retrieved March 27, 2019. ^ Lohr, Steve (October 20, 1984). "40 Years Later, Memories of Macarthur's Return". The New York Times. ISSN 0362-4331. Retrieved March 27, 2019. ^ Mercado, Juan (September 2, 2012). "Boasting of ancestors". Sunstar Cebu. Retrieved March 27, 2019. ^ "Manuel Roxas | president of Philippines". Encyclopedia Britannica. Retrieved March 27, 2019. ^ "Manuel Roxas | Presidential Museum and Library". Retrieved March 27, 2019. ^ "President Roxas on First State of the Nation Address, June 3, 1946 | GOVPH". Official Gazette of the Republic of the Philippines. Retrieved March 27, 2019. ^ Official Gazette, 42 (7), July 1946, pp. 1625–28 . ——— (2001), The Fateful Years: Japan's Adventure in the Philippines 1941–1945, 1, Quezon City, PH: University of the Philippines Press, ISBN 978-971-542-274-1 . Dolan, Ronald E, ed. (1991), "Economic Relations with the United States", Philippines: A Country Study, Washington: GPO for the Library of Congress, retrieved December 28, 2007 . Hayden, Joseph Ralston (1942), The Philippines, a Study in National Development, Macmillan, retrieved December 28, 2007 . Lacsamana, Leodivico Cruz (1990), Philippine History and Government, Phoenix, ISBN 971-06-1894-6, retrieved December 28, 2007 . Seekins, Donald M (1991), "The Commonwealth", in Dolan, Ronald E (ed. ), Philippines: A Country Study, Washington: GPO for the Library of Congress, retrieved December 28, 2007 . Seekins, Donald M (1991b), "World War II", in Dolan, Ronald E (ed. ), Philippines: A Country Study, Washington: GPO for the Library of Congress, retrieved December 28, 2007 .